Ever since the democratic system is established across the globe ,conflicts between people and the government over certain issues are quite a common thing.But some conflicts in this globe happened for a reason.Mahatma Gandhi's freedom movement,Aung san su ki 's struggle for freedom, Nelson mandela's struggle against Racism are a quite a few incident's which cannot be erased from the history. But all the above mentioned conflicts are happened between the people and the colonial government but the koodankulam conflict is happening between the Indian government and Indian people. There is a common ideology exist among Indians, If a problem is not yours and if other's problem will satisfy your needs, you are very much happy to neglect it by opposing other's thoughts so that others will become minority and your needs will be satisfied.This is what happening in Koodankulam, all the supporters are not belongs to koodankulam in other words most of the koodankulam people are opposing the project! 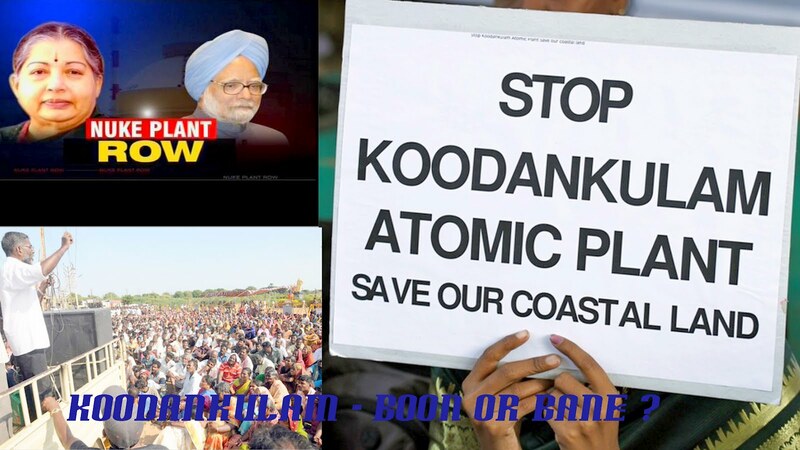 If the people in Koodankulam are opposing the project why they didn't opposed it initially?? why the people are not believing the scientists who are saying the plant is safe..? Even after so may safe-test why the people are opposing the Plant..? In France 70% of power is generated because of nuclear power plant if France people are not opposing why koodankulam people are opposing..? People didn't opposed this project initially because they were not aware of the adverse effect of the plant initially and my question to the supporters is why the government doesn't explained the project to the people initially...? People are not believing the scientist because of the past disasters happened in nuclear plant which were constructed by these kind of scientist. Especially they are afraid because of chernobyl disaster and Fukushima disaster. To the fourth question I'm not having any answer , Yes people should believe the government sometimes.! The people in India are pleased to be a follower, indeed they are very much comfortable to be a follower than a leader.Koodankulam people should think and analyse the issue properly but they are one dimensional on this issue and that's the problem. There are some questions which were raised by Koodankulam people and those are considerable questions too..! scientist and government says that the probability for Tsunami and earthquake is less in Koodankulam, But people are asking if it happened what the government will do..?? 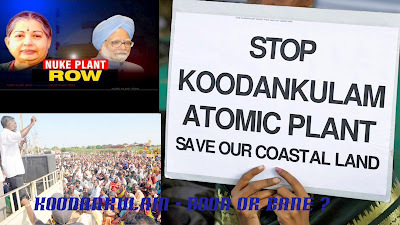 Government is creating a scene that the Koodankulam is the only solution to solve the Power cut. My Answer: yes, the government is creating a scene .other than koodankulam what are other project the government did in order to meet the power requirements. The past governments were not optimistic and they didn't planned properly. even if the koodankulam plant is opened what are the other power projects does the government is planning..? The government should be optimistic and they have to plan the future power generating project and a alternative source to meet the power requirements. Some may ask then this multi crore project should be wasted for a period of 5 years in the name of safety.Yes in order to satisfy the people the government should do this. These are my point of view and some may oppose mine, share your thoughts so that it will be helpful for a right cause.